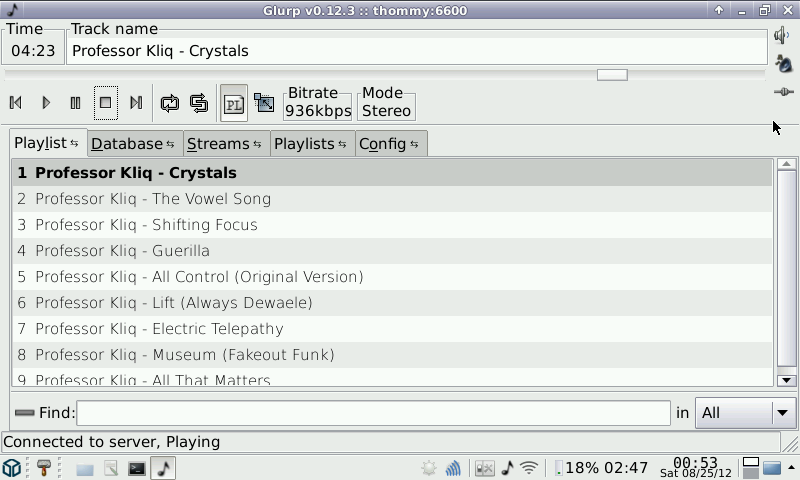 Glurp is a GTK+-2.x based graphical client for the Music Player Daemon (http://www.musicpd.org). This PND includes a wrapper script which shows a list of recently used servers on startup. The wrapper script only shows the server list after you have used at least two different MPD servers. Only the Server saved to the config file while closing glurp is stored in the list. If you want to remove a server from the list, please edit appdata/glurp/glurp_recent. This version of glurp also works with the MPD from the Music Player Daemon Package ( http://repo.openpandora.org/?page=detail&app=mpdpackage ).